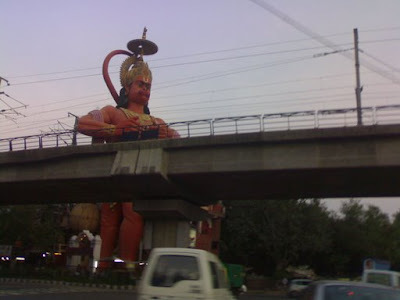 This is a huge temple built in the shape of the Hindu monkey God - Hanuman.I have taken this photo from a moving vehicle and the bridge running across Hanuman's chest is the Metro Railway track. hi i am aditya, a delhi based journalist. have done some work on delhi. First, my apologies for a bit of cut and paste commenting. I have been doing the rounds via Bloglines and looking at all the pictures from my favourite photo blogs, but haven’t been leaving comments. Generally, I try to comment as much as I can (I know how good it is for ‘morale’ to know that someone is out there appreciating them), but after the birth of my second son, I am a bit knackered to think up something witty and insightful on the hop. Thus the resort to Control+C and Control+P! almost expect him to get up and walk away.. I've been twice in your city, so your pics mean a lot to me! I have no Delhi images on my blog yet, but i will post some i took there, soon. Wonderful. And an absolutely fresh approach to showcase things that thrive in the city...and which many of us dont know. Have been in the city for some time now, but havent come across this. Made me realise how wonderful would it be to know more bout ur city rather than the same hot spots/toouristy places and stereotypes reflections. You can spot the temple at the round about where, Pusa road meets with Linking road, just opposite to Springdales school. this is one clever shot, especially the way the metro line cuts across hanuman-ji! HI, Can you tell me what the name of this form of Haumanji is? So glad to see the inside of a Hanuman temple. I saw many of these temples and shrines on our recent trip to Delhi, but the people we were with said only men could go in them. So-- very interested in the photo of your mom leaving an offering. Perhaps it had less to do with me being a woman, and more to do with me not being Hindu? In any case... thanks for sharing these photos.